It has been said that you are known by the company you keep. Professional associations are a way to “keep company” with other leaders in your industry to learn from each other and support your business growth. Lends credibility – Membership in a professional association indicates to potential clients that you are active in your profession and work to stay up to date in your field. Opportunities for education – Most associations have opportunities to learn more through speakers, professional development courses, educational webinars, articles and newsletters. Some associations also offer scholarships for members for college classes or training programs outside the association. Peer support and mentor opportunities – You have an opportunity to meet others who are in your field who can offer solutions and resources. Several of the associations I am part of have either Q&A forums or active Facebook Groups that facilitate connecting with peers to answer questions or just offer support for challenges you may face. Some associations have formal mentor matching but all offer the opportunity to meet other more experienced people who may be open to mentoring you as you grow. Networking opportunities – Getting to know the other members of the association opens up chances to share referrals for services when a client needs a service you don’t offer or when your plate is full. Other members can also be great resources for connecting you to other resources. Meet potential clients – In addition to being a member of several associations that include my peers, I am also a member of a few that cater to my clients. 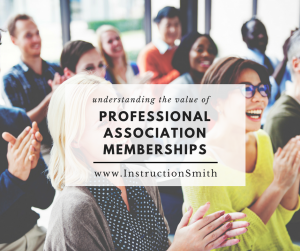 Some associations have affiliate memberships for those who provide services to the industry that the association focuses on. This type of membership works best if you seek to bring value to your fellow members, offering answers to questions and wisdom without expecting to be paid. This allows you to showcase your expertise and let people know you. When they are looking for someone with your skills you will be one of the first they think of. Discounts – Most associations have preferred partners who offer special deals and discounts to association members. I have taken advantage of association discounts on training programs, printing, FedEx shipping and office supplies. Some of these benefits more than offset the cost of the memberships. Conferences – Most associations have annual meetings or conferences. Some are even offering online summits that save on travel costs. Attending a conference can be a significant investment but the opportunity to meet other members in person and take advantage of the speakers and learning opportunities can make a really big difference in your professional growth. There are associations for almost every field of interest – and in many cases more than one! But don’t just start spending your hard earned money and join every association that you come across. It is better to find the ones that are the best fit for you and then invest both your money for membership and you time to be an active member. Talk to other current members to hear about their experiences and what value they have gotten from the association. If the most important thing to you is to meet a mentor to support you in your business find out about the opportunities to be matched. If you are looking for education opportunities, see what kinds of workshops have been offered in the last year. Get the most out of your memberships. Be sure to include your professional memberships on your website and online profiles. Take advantage of the educational offerings. Get to know other people in the association. Share your story and your challenges and offer support to others when you can. Attend meetings and conferences whenever possible. Most associations rely on volunteers for many of their activities. Offer to volunteer or join a team or group to help out with one of their initiatives – it’s a great way to get to know others and become a valuable member of the group. Here are a few of the national and international associations you might consider if you are interested in working as a Professional Author and/or Speaker Assistant. Are there other associations you have found valuable? Let us know in the comments! Learn about the kinds of services Professional Author Assistants can provide to authors to help them get their book into the world.